The inclination to keep things simple pervaded the shoot. As an example, Skinner points to a scene that takes place in a Bay Area club in low light. 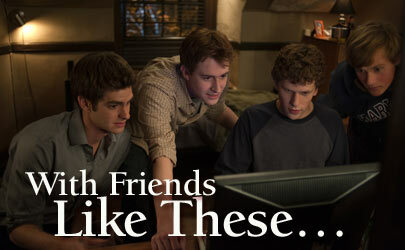 In the scene, Napster co-founder Sean Parker (Justin Timberlake) tries to educate Mark Zuckerberg (Jesse Eisenberg) about business strategies in the online world. Cronenweth says he started with a complex Technocrane shot that looked 180 degrees from the bottom floor of the club to a second-floor VIP area. Fincher wanted to enhance the chaos of the club around the two men while making Parker’s lecture sound sinister. Cronenweth’s crew also set up some moving lights to play as Eisenberg passed certain locations on the street. But the team still faced the problem of how to properly backlight edges of the iconic brick arches at Harvard Square that serve as a campus entrance. The shot, as designed, needed the backlight, but the filmmakers weren’t allowed on campus. Fincher’s solution was to hire a street performer to set up his performance cart inside the gate, and to have Cronenweth’s crew place in that cart a portable, battery-powered light source — two 500-watt ECT Photo Floods hooked up to an 1,800-watt inverter/battery pack — designed to fire up only when the filmmakers were shooting.